He created a series of large-scale paintings, each containing an abstracted letter formed with paint made from pulping an issue of the London times. (Jessica Silverman Gallery, Undated) This makes the materials hidden because without hearing or reading that story the origin of the materials is unclear. This incorporation of a hidden context within the materials is an interesting mix of conceptual and material. Amikam Toren (1992) Of the Times - Thursday April 16th, 1992. Pulped newspaper and PVA on canvas, paper and card. 234 x 219 cm. A continuation of this idea, which makes me happy in a way I cannot articulate, is what Toren calls a ‘pidgin’ painting, (Baker, 2013) (Jessica Silverman Gallery, Undated) which is a stretched canvas with removed sections of the fabric, the removed parts are turned into a form of paint (using a coffee grinder) which covers the remainder of the surface. This relational and dependant narrative is a beautifully executed idea. Amikam Toren (2002) Pidgin Painting (Yessss). Pulped canvas, PVA and pencil. 71 x 59 Inches. 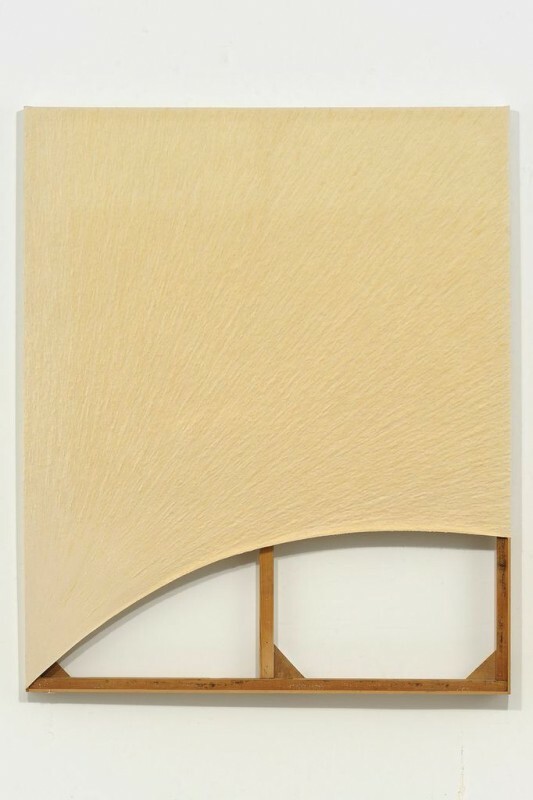 Amikam Toren (1975) Simple Fraction III. Glass, araldite, shelf, drawing. 36 x 64 x 9 cm. In the Simple Fraction series, he takes an object that has been broken and would be regarded as useless (or pre-use regarding recycling) in this case a broken milk bottle. (Jessica Silverman Gallery, Undated) Painstakingly reassembled the reformed object is displayed next to a drawing of the cracks formed. This series is an example of the multiple links found in his work. Like a fractal, the work speaks more the more the viewer looks at it. The white paper, the focus on the lines and marks in the drawing, the white shelf the bottle sits on, and the simplistic wooden frame all speak about links and meaning in the work. Amikam Toren (1979) Neither a Teapot nor a Painting. Installation, mixed media. 179 x 15 x 2 cm. In 1979 he created ‘Neither a teapot nor a painting’ a piece invoking Magritte’s ‘this is not a pipe.' (Artsy, Undated) I now find myself stuck between which piece is my favourite depiction of this idea. Magritte for its originality and impact and Toren’s for the attention to materiality in the concept. Toren turned a teapot into the paint which he then used to paint an image of the teapot that no longer exists. The painting is displayed alongside one of the unwanted fragments of the teapot, placed in a pigment jar. To me, at the moment, this idea and presentation are quite simply perfect. Toren had no formal art education, instead, he worked as an assistant to another artist for a few years. (Baker, 2013) The artist, Peter Hesse, opposed the commercial side of the artworld, an opinion that stuck with Toren throughout his career. Toren's work contains a dry humour which he saw as inevitable given that his work is about the deconstruction of the human condition. His process combines a witty dialogue between accumulation and reduction, and I find I can look at it far longer than the work of some other artists. Each piece is a simple everyday object or idea, and the reduction and assemblage of information moves his work into a practice about language, meaning itself and our interpretations of it. A note has to be made about his piece ‘A users guide to married life’. (Artsy, Undated) Reminiscent of the simple, yet very intelligent, connections Toren is brilliant at making, this edition can be enjoyed for its simplicity or as a tool to explore more profound meaning. Which is probably my favourite thing about Toren as an artist. The meaning is visual and brought by the viewer, for the most part. They will read this in a way that adds an element of mirroring of their own life. Simple pictorial clues will mean different things to different people depending on what affect and effect marriage has had on their experience. It's obvious from the text how much I enjoy Toren’s work. The simple witticism of his work inspires me and is something I would like to capture, in my own way. I've been inspired by Toren to disassemble canvas, physically. This began last year with fringing but I've begun to take it further with the aim of turning the material of canvas into a thick liquid that could be formed into a mold or reshaped. Artsy (Undated) Amikam Toren : Neither a Teapot nor a Painting [Online] Available from: https://www.artsy.net/artwork/amikam-toren-neither-a-teapot-nor-a-painting-1 [Accessed 18.11.17]. Artsy (Undated) Amikam Toren : A User’s Guide to Married Life [Online] Available from: https://www.artsy.net/artwork/amikam-toren-a-users-guide-to-married-life [Accessed 18.11.17]. Baker, K. (2013) Amikam Toren finally able to live by his art [Online] Available from: http://www.sfgate.com/art/article/Amikam-Toren-finally-able-to-live-by-his-art-5056227.php [Accessed 17.11.17]. City and Guilds (Undated) Amikam Toren : Fine Art Tutor [Online] Available from: http://www.cityandguildsartschool.ac.uk/amikam-toren/ [Accessed 17.11.17]. Jessica Silverman Gallery (Undated) Amikam Toren [Online] Available from: http://jessicasilvermangallery.com/amikam-toren/ [Accessed 17.11.17]. Tate (Undated) Amikam Toren [Online] Available from: http://www.tate.org.uk/art/artists/amikam-toren-16792 [Accessed 17.11.17]. Rauschenberg was an inventive figure, he constantly worked at the edge of thinking, working against the norms of the art world at the time. He described his practice as one of “bringing the outside in” (Manufacturing Intellect, 2016) a process that involved the use of found materials, images and objects. His practice can be described as re-presenting and re-contextualising the everyday, which could be an argument for what art itself is. Rauschenberg is an extremely influential figure most famously known for his ‘combines’ created throughout the 1950’s, which as the name suggests combined painting and sculpture. 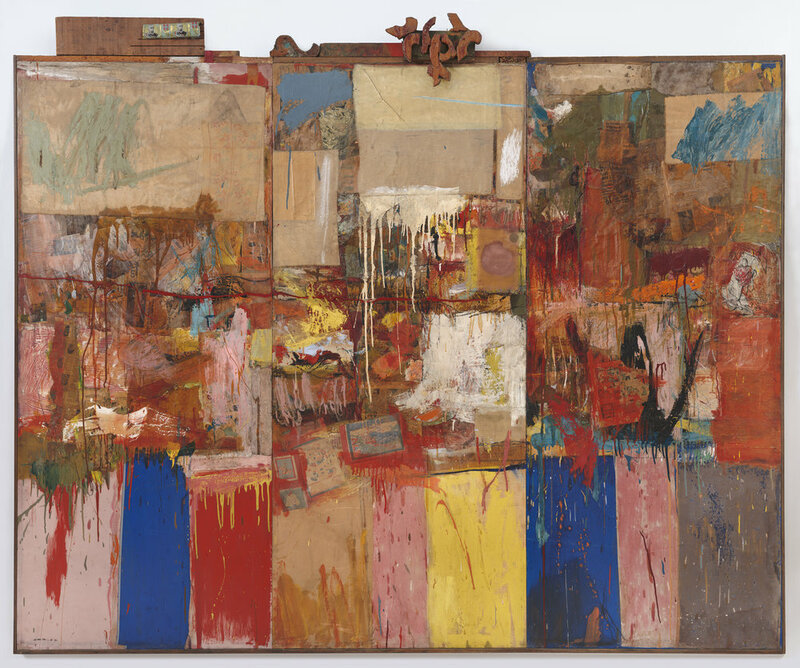 Robert Rauschenberg (1960) Pilgrim. Combine: oil, graphite, paper, printed paper, and fabric on canvas with painted wood chair. 201.3 × 136.8 × 47.3 cm. Rauschenberg positioned his work in the spaces between. Talking about his work, he said, "Painting relates both to art and life. Neither can be made – I try to act in the gap between the two." (McEwan, 2008) Which can be applied to the mediums he explored, he bridged the gap between more than painting and sculpture. No medium was out of the reach of his curiosity, which he saw as one of the most important features an artist can have. (Manufacturing Intellect, 2016) Rauschenberg was a man who saw interest and beauty in all areas around him and worked with those ideas to form new conversations. These gaps are undefined areas, albeit more extensively explored now than in the 1950’s, and that lack of definition gave Rauschenberg the freedom to explore with a light-hearted intelligence that comes through in interviews. Rauschenberg was an avid egalitarian, believing in the equality of materials, subjects, and people. There is an honesty in this inclusion, which can be seen in the work. He was a man who was unafraid of challenging the paradigm. Rauschenberg was an artist inspired by his surroundings and the people he met on his journeys. Reading about him and, more importantly, watching interviews with him hint at the fascinating way he saw the world. His prolific practice becomes more understandable when his perspective is appreciated, to Rauschenberg anything could be art with the right artist to pull strings. Rauschenberg saw the potential of the materials he was working with, but more importantly perhaps saw the reality of what they already are. He worked with a surface of coloured pages from newspapers so that the painting wouldn’t have a beginning. (Robert Rauschenberg, 2016) He already had a surface to work on. He then added to what was already there. It could be argued that paints already do this to a degree. If you begin with the possibilities of the material, and you then let them do what they want to do. The artist becomes a bystander. Robert Rauschenberg (1954/55) Collection. Oil, paper, fabric, wood, and metal on canvas. 203.2 x 243.84 x 8.89 cm. Equally inspiring for Rauschenberg was the work of dadaist Kurt Schwitters, whose collages contained rubbish collected off the streets. (Unnamed, 2013) Rauschenberg combined found objects (often found in his local neighbourhood in New York), with collage and painting. In this approach, he combined the reality of the objects represented against the illusionistic nature of painting. The medium became the representation of itself. Robert Rauschenberg (1961) This Is a Portrait of Iris Clert If I Say So. Telegram with envelope. 44.8 x 22.5 cm. Robert Rauschenberg (1951) White Painting [three panel]. Latex paint on canvas. 182.88 x 174.32 cm. In 1951 he created a series of ‘White Paintings.' The antithesis of the emotional and colourful work being done by the Abstract Expressionists, this series has been said to have been a precursor to Minimalism, by a decade. The works in the series are formed of groups of modular panels, each the same size, shape, and form. Their size is based on a simple mathematical formula; the width is half the length of the height. This is the limit of the prescribed control that the artist has, beyond which the works become something more. Conceptual paintings. Rauschenberg was friends with composer and artist John Cage, whose theories of chance were influential. 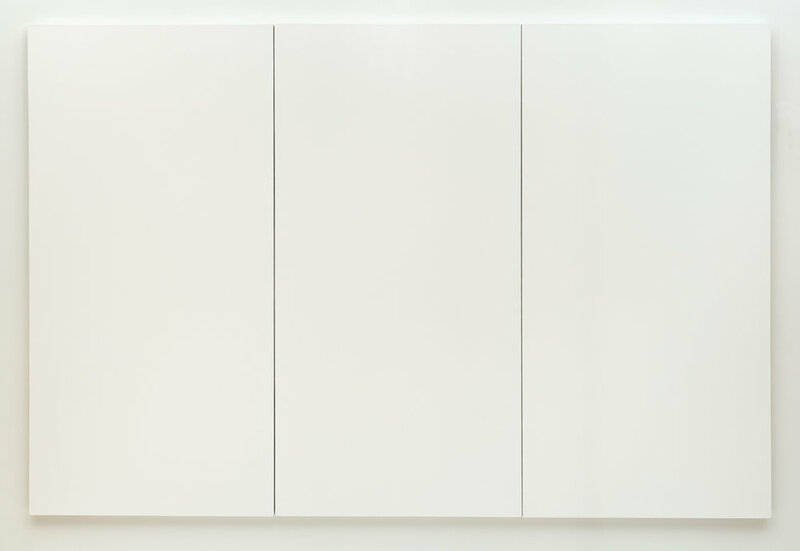 (Painters painting, 1973) The ‘White Paintings’ have been compared to Cage’s musical piece 4”33’, in which the musician plays nothing, and the music is the ambient and other sounds in the space itself. The ‘White Paintings’ can be seen similarly, their uniform surface allows for an appreciation of the space in the gallery, and the shadows cast onto the paintings themselves become a focus, as opposed to any subject within the paintings themselves. These white panels reflect the light of the space and reflect the mute potential of a blank canvas while highlighting the features of the existing surface. In the same discussion, Rauschenberg referred to the works as clocks, a way, if you were a sensitive enough viewer, to read the details of the space around you, using the surface of the paintings, in this sense they are mirrors that encourage the viewer to see beyond the work, to the world around them. Robert Rauschenberg (1957) Factum I and Factum II. Combine painting: oil, ink, pencil, crayon, paper, fabric, newspaper, printed reproductions, and printed paper on canvas. 156 x 91 cm. In 1957 he created a diptych, which was displayed at a recent exhibition at the Tate Modern. 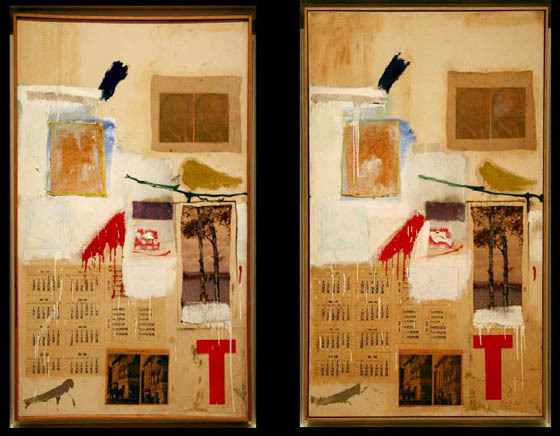 (Robert Rauschenberg, 2016) ‘Factum 1’ and ‘Factum 2’ are collages that are identical in size and near identical on the surface. After creating the first, the second was made as close to the ‘original’ as the materials, and the artist's hand would allow. The pieces highlight the importance of the chance elements in the work, the drips that could not be controlled entirely for example. These aspects of the incidental and uncontrolled form a pause of sorts between the two pieces, a visual stutter as the viewer attempts to unpick the differences between the works. The external visuals Rauschenberg has used are identical, but other paint marks are not, which opens an interesting dialogue about the nature of accidents. Robert Rauschenberg (1953) Erased de Kooning Drawing. Traces of drawing media on paper with label and gilded frame. 64.14 x 55.25 x 1.27 cm. The more I look into Rauschenberg’s extensive works, the more I find of interest, but it remains relatively simple to articulate my favourite. ‘Erased de Kooning Drawing.’ Rauschenberg asked himself if there was a way to create something with an eraser. When he realised that rubbing out one of his drawings was not wholly satisfying, he decided that what he needed was a drawing that was already a work of art. Although initially reluctant De Kooning was convinced, although he proceeded to find a drawing with a combination of marks that would be difficult for Rauschenberg to erase, it took several weeks for him to complete the work. The work has been compared to Duchamp’s LHOOQ, in which Duchamp drew a moustache on the Mona Lisa. For me, the work is important on various levels. The fact that Rauschenberg chose De Kooning, who was possibly the most prominent Abstract Expressionist at the time, that he was able to create something with something normally used for destruction, that the result is minimal, that he is deleting a drawing (which was still and is still seen as the vital prelude to painting) and most importantly for me, that he is questioning what is art. Was it art before he started?? Is it art now?? Whether both are true, or only one is, the comment and the process remain essential for our understanding of what art can be, and what artists can do. Robert Rauschenberg was a man who responded to the world around him with clarity and confidence. His works are creative, challenging and deeply communicative. To Rauschenberg art doesn’t come from art, it comes from the world around us, and it should reflect that. A short note about the Tate Modern Exhibition (2016) made after my visit. Robert Rauschenberg (1955-59) Monument. 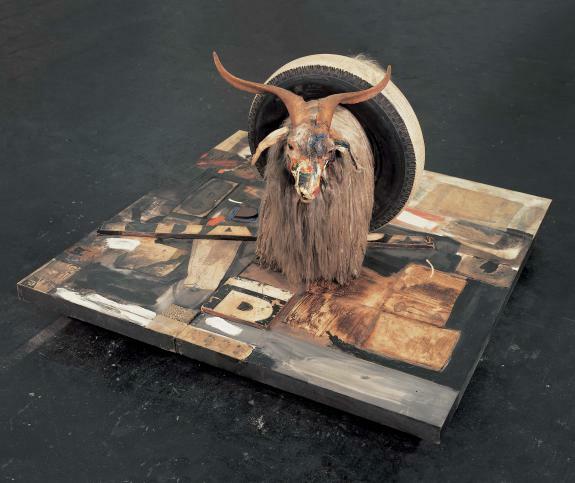 Combine: oil, paper, fabric, printed paper, printed reproductions, metal, wood, rubber shoe heel, and tennis ball on canvas with oil and rubber tire on Angora goat on wood platform mounted on four casters. 106.7 x 160.7 x 163.8 cm. Being able to see works I have only appreciated either digitally or in print remains indescribable. The rooms are varied, and occasionally the single link between the work is Rauschenberg himself. His prolific practice is explored, though apparently not fully experienced, through a brilliantly curated show, which retains a coherence that is a risk when investigating such a massive and varied archive of works. This exhibition seems to epitomise the man rather than focus on any single aspect of his work. This exhibition showed the variety and accomplishment of this artist. Rauschenberg is hugely inspirational to me, regarding his fantastic work and the way he worked and lived. As a retrospective, it is incredibly successful, in my opinion, as it balances the variety and development of his work without losing coherence or contact. Rauschenberg was an incredibly inspirational man and artist, one who claimed to never experience writers block. In his work the line between art and life is diminished, understanding the artist it becomes more evident that this line was reduced in his life as well as his studio. Art was his life, and he continued to do it whether feeling inspired and productive or depressed and drinking. A restless, curious, passionate, talented and inspirational artist and figure, the exhibition is one I am singularly glad I was able to go to. Kimmelman, M. (2008) ‘Robert Rauschenberg, American Artist, dies at 82’, New York Times, [Online] New York Times. Avaliable from: http://www.nytimes.com/2008/05/14/arts/design/14rauschenberg.html?pagewanted=all [Accessed 18.11.18]. Lippard, L. ed (1997) Six years: the dematerialization of the art object from 1966 to 1972…. London: University of California Press. Manufacturing Intellect (2016) Robert Rauschenberg Interview (1998) [Online Video] Avaliable from: https://www.youtube.com/watch?v=tDUbPqBRPvY [Accessed 17.11.17]. McEwan, J. (2008) ‘Robert Rauschenberg: Restlessly experimental artist whose career was a celebration of change’, Independent, [Online] Avaliable from: http://www.independent.co.uk/news/obituaries/robert-rauschenberg-restlessly-experimental-artist-whose-career-was-a-celebration-of-change-828260.html [Accessed 18.11.17]. Robert Rauschenberg (2016) [Exhibition]. Tate Modern, London. 1 December 2016 - 2 April 2017. SFMOMA (Undated) ‘Robert Rauschenberg, White Painting [three panel], 1951’ [Online] SFMOMA. Available from: https://www.sfmoma.org/artwork/98.308.A-C [Accessed 17.11.17]. SFMOMA (1999) ‘Robert Rauschenberg, video interview by David A. Ross, Walter Hopps, Gary Garrels, and Peter Samis, San Francisco Museum of Modern Art, May 6, 1999.’ [Online] Available from: https://s3-us-west-2.amazonaws.com/sfmomamedia/media/uploads/documents/research/rrp_sfmoma_rauschenberg_interview_may_6_1999.pdf [Accessed 17.11.17]. Tate (Undated) ‘Experiements in Art and Technology (E.A.T.) [Online] Available from: http://www.tate.org.uk/learn/online-resources/glossary/e/experiments-in-art-and-technology [Accessed 17.11.17]. The Robert Rauschenberg Foundation (Undated) ‘The Robert Rauschenberg Foundation’ [Online] Available from: https://www.rauschenbergfoundation.org/art/art-in-context/stoned-moon [Accessed 17.11.17]. Unnamed (2013) ‘Kurt Schwitters, inspiration of Pop Art’, The Telegraph, [Online] Available from: http://www.telegraph.co.uk/culture/art/art-features/9810512/Kurt-Schwitters-inspiration-of-Pop-Art.html [Accessed 18.11.17]. This is a post that will (Hopefully) continue to be updated as time progresses. This is a place for related words, that don't necessarily have anywhere else to go, but their interrelation is interesting nonetheless.